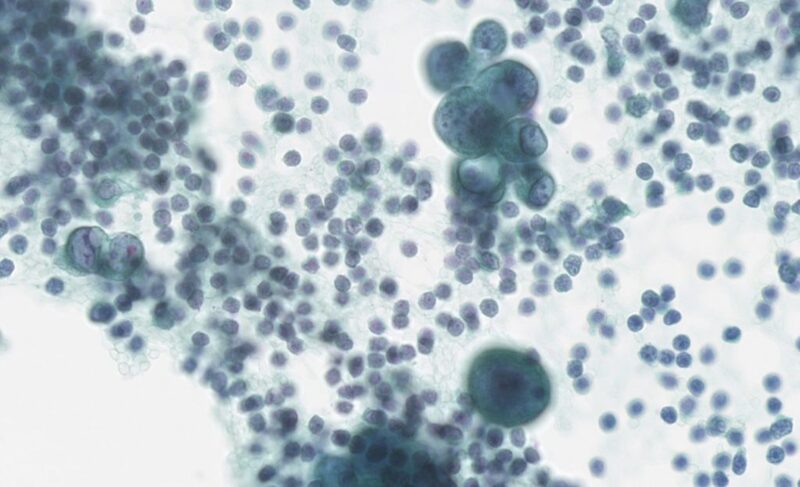 A 57 year old previously healthy female presented with new-onset pleural effusion. Microscopic description: This smear is composed of tridimensional groups of large cells (2-3 times larger than a lymphocyte) exhibiting marked nuclear atypia (i.e., hyperchromasia and uneven nuclear chromatin), nuclear membrane irregularities, prominent nucleoli, and high nuclear/cytoplasmic ratio. Also, they exhibit small vacuoles that could represent mucin. The background is mainly composed of polymorphous lymphocytes as well as some reactive mesothelial cells. These findings all support a diagnosis of metastatic adenocarcinoma. It is difficult to determine the primary based on the morphology of the cells. Thus immunostains were performed. The atypical cells were positive for PAX8 and CK7, and negative for CK20 and WT-1. This pattern suggested a GYN origin, such as ovarian adenocarcinoma, although other primaries could not be excluded. An adnexal mass was discovered later in this patient and chemotherapy was initiated. Differential diagnosis: Empyema presents with large amount of polymorphonuclear leukocytes. 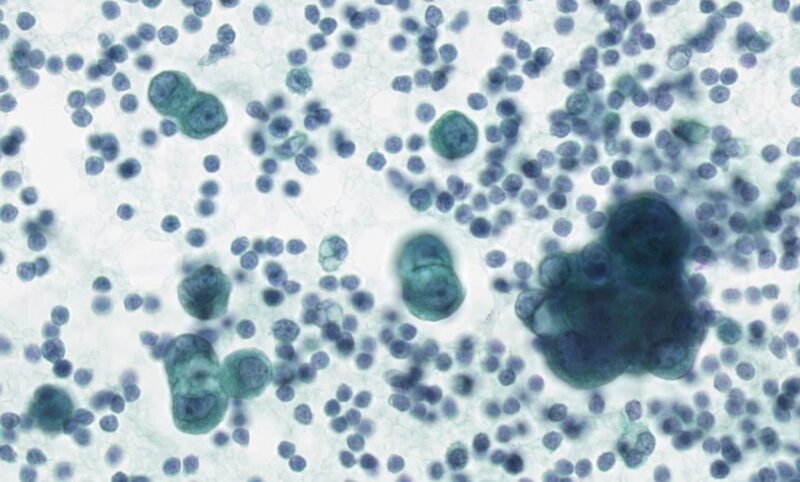 Malignant mesothelioma, as well as reactive mesothelial cells, preserve the characteristics of their precursors, including cytoplasmic staining reaction and intercellular articulation, which are not seen in this specimen. 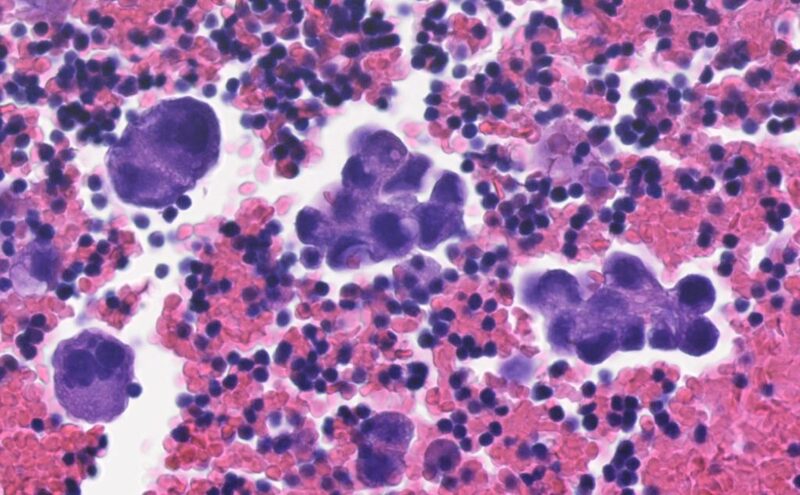 Lymphoma can exhibit large and highly atypical cells in a pleural fluid like this case, but the cells are discohesive and display a scarce cytoplasm.